Nature’s Sunshine Bifidophilus Flora Force® maintains the environment of the intestinal tract to encourage a healthy balance of flora. These friendly flora can decrease in response to various factors such as stress, environmental conditions, or certain substances that pass through the digestive system. Lactobacillus acidophilus, bifidobacterium longem, L. casei, and L. rhamnosus, microorganisms contained in Bifidophilus Flora Force, nourish the immune system and offer probiotic properties. An additional nutrient, short- and long-chain fructo-oligasaccharides encourage the growth of other beneficial organisms to aid in digestive function. 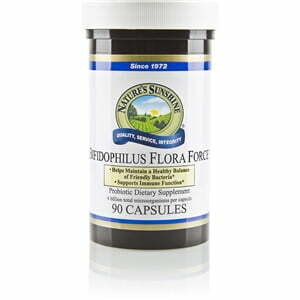 Bifidophilus Flora Force should be used daily to balance friendly flora. It keeps best when refrigerated or frozen. 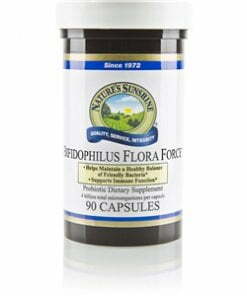 Bifidophilus Flora Force capsules include a modified release formula to slow the release of the contained nutrients until they reach the intestinal tract. Instructions: Adults: Take one or two capsules daily with a meal. Children: Take one capsule daily with a meal.